The beef between Prezzo and Mustapha seems to be growing each passing day. After uncle Muss was involved in a road accident a few days ago, his archenemy Prezzo is reportedly said to have been heard saying that ‘he wishes Mustafa could have been the one hurt instead of Luwi who is currently in a coma. 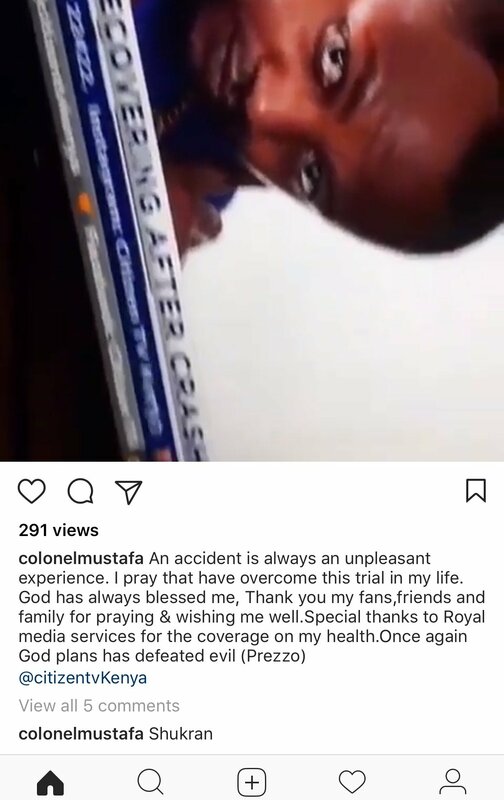 These statements sparked a debate on social Media as fans came out to ask Prezzo to apologize – but as you can see he has not reached out to Mustafa to say anything. An accident is always unpleasant experience. I pray that have overcome this trial in my life. God has always blessed me, Thank you my fans and friends for me praying and wishing me well. Special Thanks to Royal media for the coverage on my health. Once again God plans have defeated evil (Prezzo). Well looks like the war between these two has just fired up!